Anne Hidalgo was born in 1959 in San Fernando, Spain and moved with her family to Lyon in 1961. After obtaining her degree, Anne Hidalgo worked as labour inspector in the 15th arrondissement of Paris in 1984. In 1991, she was delegated to the Ministry of Labour before becoming director the National Institute of Labour, Employment and Vocational Training. In 1995 she joined the International Labour Office in Geneva and made her entry into politics in 1994 by joining the Socialist Party where she occupied political positions in various ministerial offices. In 1997 Anne Hidalgo was appointed as advisor of Martine Aubry, Minister of Employment and Solidarity, during the Chirac-Jospin cohabitation. The following year she became advisor for Nicole Pery, Secretary of State for Women’s rights and vocational training where she developed laws on gender and youth employment. From 2000 – 2002 was appointed technical advisor in the cabinet of Marylise Lebranchu, Minister of Justice. 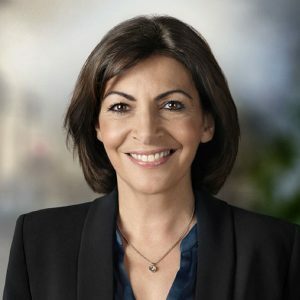 In 2001 Anne Hidalgo was elected municipal councilor in the 15th arrondissement of Paris and became the first Deputy Mayor of Paris responsible for equality between men and women. In 2010 she was re-elected as regional counselor of the Ile-de-France and also became the Chair of the standing committee of women elected to the World Mayor Commission. As candidate in the municipal elections in May 2014 she won the election against her Nathalie Kosciusko-Morizet and became officially the first female mayor of Paris.